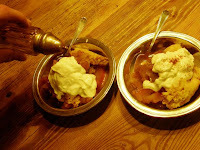 Earlier this month I made an Apple Pandowdy in the Guardian Service Casserole/Tureen cooker so delectable that Andrew urged me to write his sister about it. We recently sent her a Casserole/Tureen cooker and thought her family would enjoy this American classic as much as we did (the recipe I used dates back over 250 years). Andrew asked that I send you the recipe for a dessert I made in our Guardian Service Casserole/Tureen cooker the other night. Easy, delicious and an old American Classic and something we imagine EVERYONE will love. The attached recipe is from "New England Cookbook" (Random House, 1954) by Eleanor Early, a "born and bred New Englander.” I make note of my variation (I was out of cider, so I used some sangria still in the fridge from Christmas--it had cured nicely with orange, pomegranate, apple, raisins and spices--impossible to reproduce but divine...). Let audience and inspiration determine your own variations. After assembling the apples, sugar, spices, juices and dotting with butter, roll out the biscuit dough (to about a 1/2" thickness, large enough to cover the diameter of the GS tureen) and cut three slits in the dough (doesn’t have to be arty, it’s all going to steam together), then cook it in the preheated outer Tureen liner for 45 minutes or so (on medium heat). Let it stand for 15-20 minutes before serving. 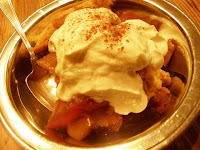 I was half-expecting this to turn out like an upside down cake (since the method is the same), but it's a quasi-cobbler/apple pie (the biscuit dough is more like a thick crust; it steams a bit and melds with the apples below). Just cut through the crust and spoon it out and serve à la mode (or with yogurt the next morning... if there's any left...). And for your listening pleasure, from 1946 (and on 78 RPM, yet!) Dinah Shore sings "Shoofly Pie and Apple Pandowdy." "This is the recipe of Mrs. Israel Putnam of Connecticut, whose husband left his plough and marched off to join the Patriots. Her great-great-great-great-grandson tells me that his family has been eating it for 200 years." 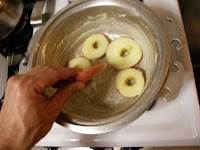 Arrange apples in buttered baking dish (the Tureen). Add cider. Mix spices with sugar and sprinkle over apples. Dot with butter. Cover with biscuit dough ½-inch thick. Make slits in dough with knife for steam to escape. Bake in 350° oven (the pre-heated Casserole on medium heat) until apples are tender. 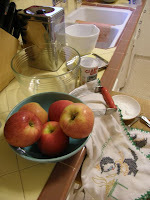 Time depends upon texture and quality of apples. Serve warm. * I was out of cider and a little short of a full cup of brown sugar, so I tried this variation: juice of 1 lemon, tbsp. molasses and a bit of Sangria (or red wine, pineapple juice, cranberry juice, pomegranate juice, etc). 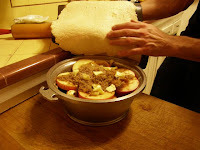 Below: preparing the Apple Pandowdy in the Guardian Service Casserole/Tureen cooker. Browning an optional finishing touch. Served here with yogurt, dusted with cinnamon. "When I was ten years old I was permitted, as a special treat, to make biscuits one Sunday for supper, and thereafter I made them almost every Sunday for about five years. By that time my ideas of a “special treat” had changed considerably. But the family never tired of baking-powder biscuits. We had them with warmed-up beans and piccalilli and cold meat left over from Sunday’s dinner." Add milk and mix lightly until milk is absorbed. Toss dough on floured board. Roll out lightly to about ½-inch thickness. Cut with floured biscuit cutter. If you wish biscuits with soft, fluffy sides, place close together on baking sheet. If you prefer biscuits with crusty sides, place 1 ½ inches apart. For lightly browned biscuits, use a shiny cookie tin or pan. 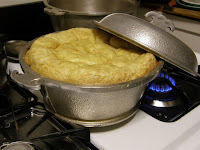 An old, darkened pan will burn biscuits on the bottom. Bake in 450° oven about 12 minutes. 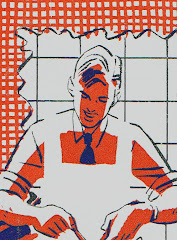 (In my little-girl cookbook there is penciled, “If baked slowly, gas will escape before it has done its work”—something to do with paking powder, I suppose—so remember—a hot oven for biscuits.) This recipe makes about 16 2-inch biscuits. At our house we had a little 1-inch cutter and it was possible to coax out 26 tiny biscuits, 4 a piece for the 9 of us. 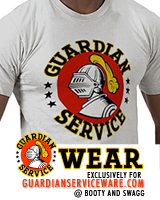 Vegetables, "The Guardian Service Way"